The attack on the Intercontinental hotel in Kabul renews concerns over the capacity of Afghan security forces. The Intercontinental Hotel in Kabul was anything but the serene oasis that it’s usually seen as during an intense siege that started Tuesday night and that lasted until the early hours of the following morning. Nine Taliban militants stormed the building and shot indiscriminately at hotel guests, staff and clientele before finally detonating their suicide vests or being shot by military forces. The attack is yet another show of defiance by an increasingly brazen insurgent movement against the Afghan government and international forces. Kabul has been witness to several particularly deadly sieges and suicide attacks in the past few months. A suicide attacker on April 18 managed to infiltrate the Ministry of Defence compound by dressing in military uniform. More recently, the military hospital in the city’s diplomatic district of Wazir Akbar Khan was the scene of horrific violence when six medical students and 23 others were injured in a suicide bombing on May 21. Covering this latest attack, Erin Cunningham, writing for The National, reported that rocket-propelled grenades were launched from the roof of the hotel toward the first vice president’s house. 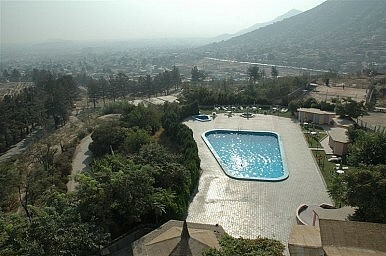 The militants had crept through the bushes leading up to where the hotel was located on a hill overlooking the city. Camouflaged by the night and high shrubbery, the attackers were able to avoid police checkpoints on the road and storm the hotel through the garden at the back. Two suicide bombers then detonated their vests in the lobby of the hotel creating the diversion that the remaining attackers needed to charge to the top of the building. Reports from guests in the building confirm that there was significant confusion as the attack unfolded. The clientele of the hotel, which included a wedding party and visiting dignitaries, were greeted by insurgents brandishing machine guns as the hotel was plunged into darkness. The Afghan National Army, quickly on the scene, had apparently cut the power to the hotel to gain an advantage against the attackers as the military were equipped with night-vision goggles. About four hours into the siege, at 3 am, NATO helicopters arrived to assist the Afghan military forces battle the insurgents. Helicopter snipers killed three of the insurgents on the hotel rooftop, allowing Afghan security forces to make their way up to the roof and tackle the remaining Taliban militants. At the end of the ordeal, nine Taliban and nine civilians were reported dead, with several others wounded. The Taliban was likely targeting government officials and security advisors who were staying at the Intercontinental for a two-day conference on the security transition that was scheduled to take place the day after the attack. There’s now increased uncertainty over the ability of Afghan forces to take full responsibility for the security situation in the country. The conference at the Intercontinental was preparing to discuss the transfer of responsibility from international security forces to the Afghan military and police. Preparatory discussions on the transition are being held following US President Barack Obama’s announcement on June 22 that the United States would withdraw 33,000 troops from Afghanistan by autumn 2012. Talks are currently being held between international forces and the Taliban to foster dialogue for a resolution to the decade-long war. But questions are already being asked about how much the international forces really know about the Taliban and various other insurgent groups in Afghanistan. Speculation is rife, for example, that although the Taliban claimed responsibility, the attacks were actually carried out by an independent insurgent group affiliated with the Taliban called the Haqqani network. CNN reports that an official source corroborates this claim. If there’s any truth in this, then it’s hard not to wonder how much progress talks with the Taliban will ultimately make. The Haqqani network originates from North Waziristan in Pakistan and is led by Maulvi Jalaluddin Haqqani and his son Sirajuddin Haqqani. It’s believed that the group maintains links with Pakistan’s Inter-Services Intelligence. The network has either claimed responsibility, or is believed to have been responsible, for a string of attacks that occurred in Afghanistan, most notably those against Indian targets. The January 14, 2008 Serena Hotel attack, the July 7, 2008 Indian embassy attack and the May 18, 2010 Kabul bombing are all alleged to have been the work of the Haqqani network. Official acknowledgement of dialogue with the Taliban is a distinct shift in tactics for the United States. But with the increasing dominance of independent insurgent groups and warlords, the question is whether the offer of an olive branch has come too late. If the talks aren’t conducted carefully, there could be further segmentation of the Taliban, an organisation that already seems disparate and elusive. Still, the Intercontinental attack, and the Afghan forces’ inability to handle the situation itself, highlights the reality that a political resolution will be more effective than a military one. The decline of centralised power has come as militants appear increasingly organised. This latest attempt to thwart security representatives entering meaningful discussions over the county’s security only complicates efforts to engage an increasingly fragmented and intransigent enemy. Revelly Robinson is an Afganistan-based journalist. 2014 Looms Large for AfghanistanHanging with Kabul’s ‘Invisibles’Stalemate in AfghanistanDecision Time in AfghanistanHas US Turned Afghanistan Corner?